A rare outfit shot in Paris when the weather cooperated for about 5 minutes. I would’ve frozen for Paris though. I spent 5 days in Paris towards the end of April and got to roam around (and around, and around thanks to the hop on, hop off bus I abused). Though I wanted to take full advantage of every beautiful sight – even the Parisian Metro was gorgeous (at least on the outside) – unfortunately the cold weather didn’t necessarily permit me to take more than the occasional blog-able post. Because if I’m being honest here (which is all I ever am in this blog really), I only brought one coat. And in hindsight, that wasn’t very shrewd for a 2-week vacation proven by the fact that it was ruined mid-trip I had to buy another one. Still, here’s one of those rare moments that I had the weather’s cooperation with the sun up for about 5 minutes before it turned cool again and my nose, in reaction to all the exposed skin, runny. Too much honesty, this time? Wore another of my By Tipay pieces. It may look like your typical off shoulder sweater but it’s not. 1) It’s made out of pineapple fabric (as is this one), and 2) it has a subtle hole for the thumb covering about 3/4 of my hand which I truly appreciated weather-wise. Paired red and red on purpose but the pinks were unintentional. Guess I’m wired to be matchy-matchy. The photos were taken at the Jardin des Tuileries right across the famous Louvre Museum which I didn’t bother lining up for – the line was very discouraging. I went during Easter break and everyone seemed to be in Paris that weekend. 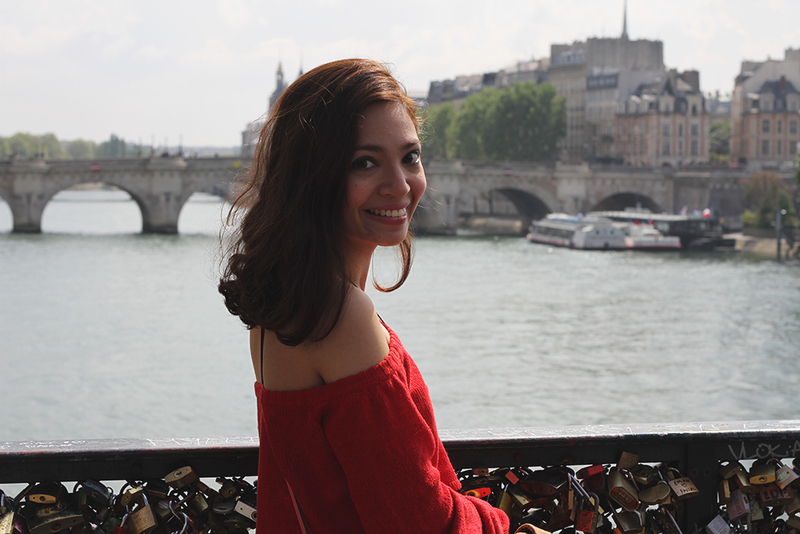 A stray photo was taken by another famous area, the Pont De Archeveche – the long bridge with the padlocks of love overlooking the river Seine. Paris was so breathtaking and the food was surprisingly amazing. So happy that my first trip to Europe was divine (hyperbolically and literally – I attended a pilgrimage). I can’t wait to go back sans the hordes of tourists this time hopefully. I’m getting a bit ahead of myself though so I’ll just go through my photos and share them with you while I plot my return, whenever that may be.